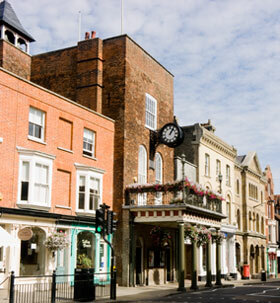 Located between All Saints Church and the top of Market Hill the overhanging clock marks the historic centre of the town. The Moot Hall has dominated the High Street in Maldon for hundreds of years. Originally built for the D'Arcy family in 1496, this building has seen various uses since it was obtained by the Borough in 1576. The building was purchased to replace the the earlier Moot Hall premises which still stand on the corner of Silver Street and remained the seat of local government until the creation of the Maldon District Council in 1974. The Moot Hall is one of the earliest brick buildings in Essex, the ground floor with it's high ceiling housed the police station and cells. 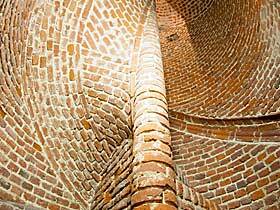 A brick spiral staicase rises to the first floor which still contains the courtroom which was constructed around 1810. 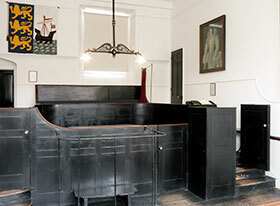 The courtroom served as a Magistrates Court and a Court of Quarter Sessions until 1950. 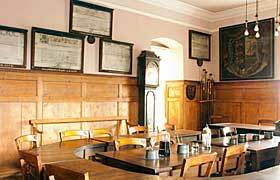 The second floor houses the Council Chamber which was the centre of municipal life for 400 years. On display are the royal charters given to the borough by various monarchs going all the way back to the Plantagenets. The spiral staircase continues to the roof which offers the ultimate views of the rooftops of Maldon and the Blackwater estuary. Also on the roof are the chimes of the town clock which were given to the borough by it's MP George Courtauld in 1881. As the Moot Hall is a Grade One listed building it cannot be altered in any way and therefore access for disabled visitors is limited as the upper floors are reached by narrow, twisting stairways.